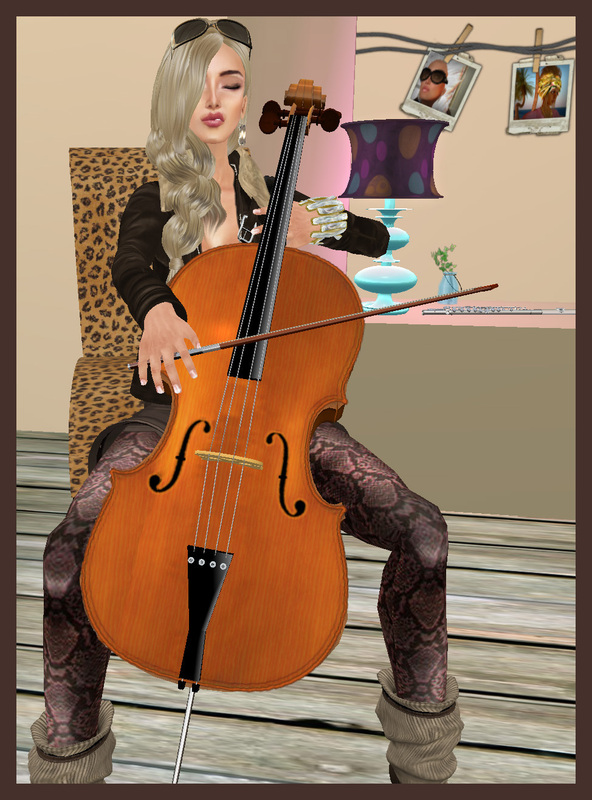 When you play the cello you have to practice…but ahem….as you can see, occasionally I hit a flat note. 😦 But my cello is beautiful and best of all it comes with its own melodies that do actually always sound perfect. I also play the flute so I should (^^) spend a lot more time practicing. Both my cello and flute are from poco a poco where you can find some beautifully made musical instruments including harps, pianos, violas and violins. They all come with melodies and you can even buy extra ones just in case you feel like giving a concert for your friends. 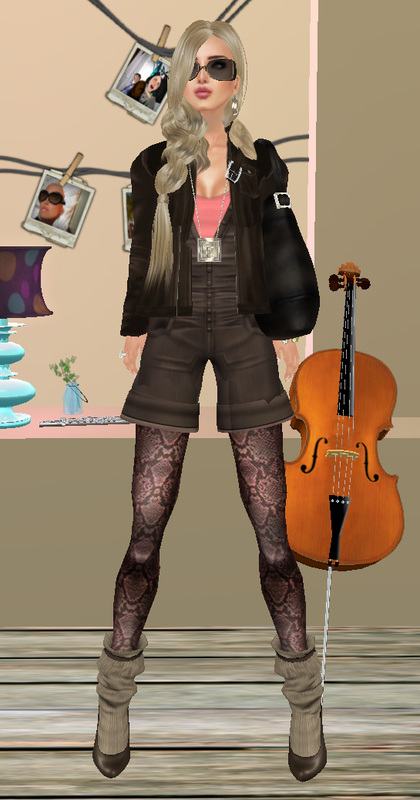 While playing I am wearing one of my favorite shorts outfits from Michami. It is jazzed up with python-printed tights (freebies!) and some amazingly bright jewelry from Fabulous and Icon. The leather jacket is from Muism. 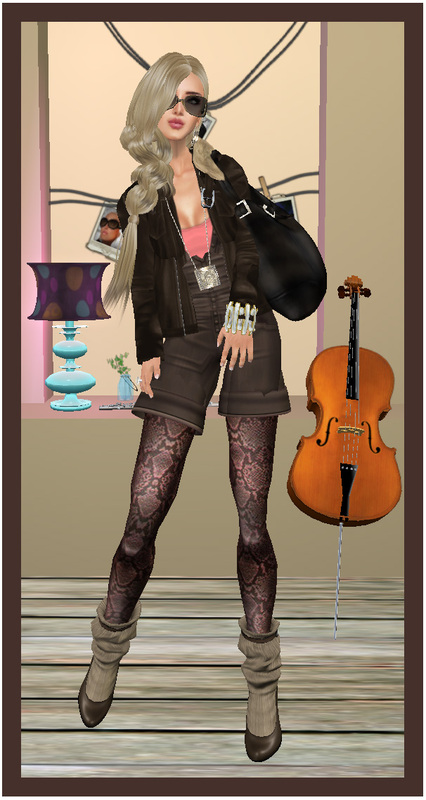 None of the items seen here are really new but I love them all, especially my Dejavu hair! Okies, got to run….shopping to do, enough practice! Things really have been hectic these past few days in SL. What with the Relay for Life Clothing Fair and all its fantastic people— the organizers, the designers, the entertainers and the general shopping public who have been there in droves—it is hard to think about much else. But at the same time we have St. Paddy’s Day, some great hunts and (!) Lelutka’s Spring line coming out. So, I have decided to show what I have been wearing around instead of featuring all the new items I have been adding to my already bulging inventory. (I need a day or two to sort it all out!) Anyway, I love this look with its tight, straight skirt and patent leather belt paired with the Akeyo man-ish hat and severe hair cut. To balance out the masculinity there are the diamond earrings from Redgrave that give it a nice little edge. 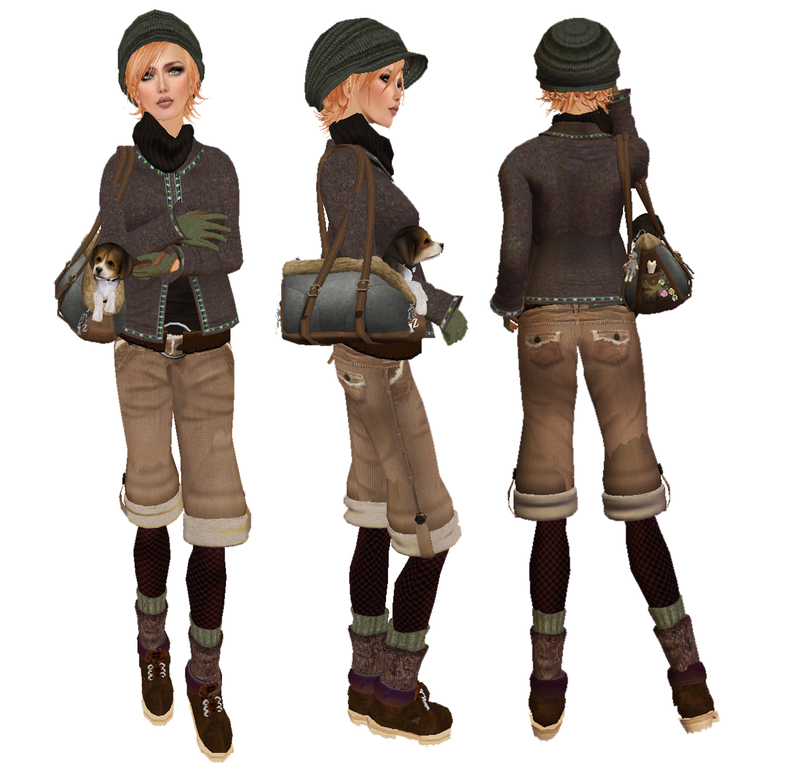 The plaid top is from Lelutka’s LaLa coat from their Fall collection. To soften the neckline, sey’s Afghan stole which is scriptable (both to resize and texture). By the way, I did NOT wear this to the RFL as everyone is asked to please keep their ARC (Avatar Rendering Cost) as low as possible. Free outfits are being given out which will help reduce lag and make the Fair a better experience for everyone. For info on how to reduce ARC check out the official blog of RFL here. Yesterday I wrote a post featuring the beautiful Loli asymmetrical jacket from Cupcakes with a sophisticated, dressy pant. Today, I wanted to show two other looks put together with the same jacket. In the first photo the jacket is worn with a skirt. I think it looks great with a skirt—even a slightly full one like this super-cute balloon skirt from the Creamshop. (A great skirt to have and it is available in many, many —nine, I think— colors.) I love pieces like these that can work with everything and I was really surprised at how great this little jacket blended with almost everything I tried. I included a back view so you could see the detail on the back of the jacket…so pretty. By the way, Loli also comes in three other beautiful jewel tone colors. The second outfit is much more casual and pairs the asymmetrical jacket with Zaara’s new velour pants and a pair of riding boots. To contrast with the casualness of the pants and belt, the necklace is a dressy gold, pearl and crystal one from Paper Couture and the purse is an alligator handbag from Lelutka. The bag is one of my favorites that works well with almost anything. I have always been a fan of Cupcakes…the clothes are cute, as well as beautifully textured and constructed…but the other day when buying up a few of the new spring items… I saw this wonderful asymmetrical jacket. How could I have missed it before? It looked really interesting and I couldn’t wait to try it on. Wow! Do I love it?!! It is so well done and the style is amazing. I started trying on different pieces with it and quickly came up with 3 different outfits for 3 very different looks. I couldn’t decide which I liked better so I will show all of them to you in installments. First, the “Audrey” look. Named after the hat from Lelutka which I am sure is named for Audrey Hepburn <3! Hope you like it and you’ll see the other two shortly. Sometimes, it’s just the design of the fabric or maybe the color that draws you in…..but for me this top/dress from The Closet was all about the shape. Soft and feminine, light and airy with a delicate empire waist— it just said “buy me”. It has beautifully detailed prim pearl buttons on the sleeves and front and a layer of dotted voile over the top that gives it depth. It will be great worn as a dress with high-wrapping sandals for warmer weather, but for today I wanted a sophisticated, yet casual afternoon outfit. Something to wear to an uptown lunch. Add a pair of linen pants, pearl earrings, some chic flats and voila’. Look what I got for my birthday…Oscar! Isn’t he cute? I know you have already seen these darling dogs sold by Zoobies….they really are the ultimate accessory and they are so much fun. He looks around, and barks, and makes all kinds of little puppy noises. (Luckily it’s all menu-driven if you don’t want to be bothered by the sound). 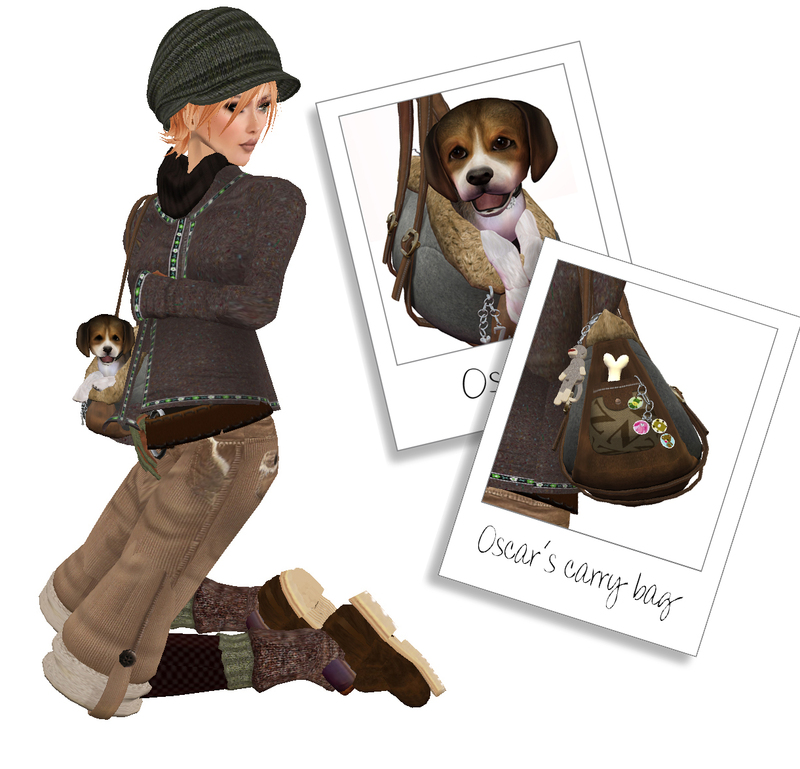 Oscar is accessorizing a cute little Tyrolean outfit from Anuenue…one of my newly found favorite stores. The cardigan is a nicely textured, Austrian boiled wool with ribbon trim embroidered with what looks very much like edelweiss ❤ . The half pants are wide-wale corduroy trimmed with mouton at the knee and they have the most wonderful pocket and waistband detail. (To see the detail larger, click on the photo.) I love the Timberland-style hiking boots from Swaffette Firefly and the belt from Reale. Oh, oh, oh… and check the detailing on Oscar’s carrier…toys! Even a miniature sock-monkey. It just can’t get any cuter. I think that is how it goes. Yes, Elisabeth has taken up knitting. But that sock just won’t be finished…..whatever… I guess it is the busy work for the hands that counts. 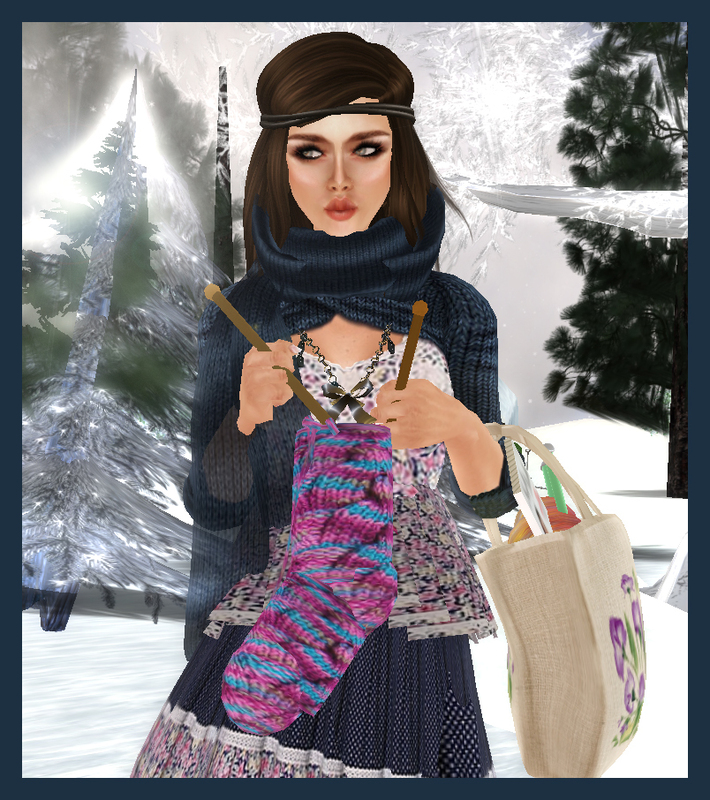 True… at this rate I will be hitting up all the sock stores in sl if I need more. I found this knitting set in my inventory and realized I bought it ages ago and had never unpacked the yarn. 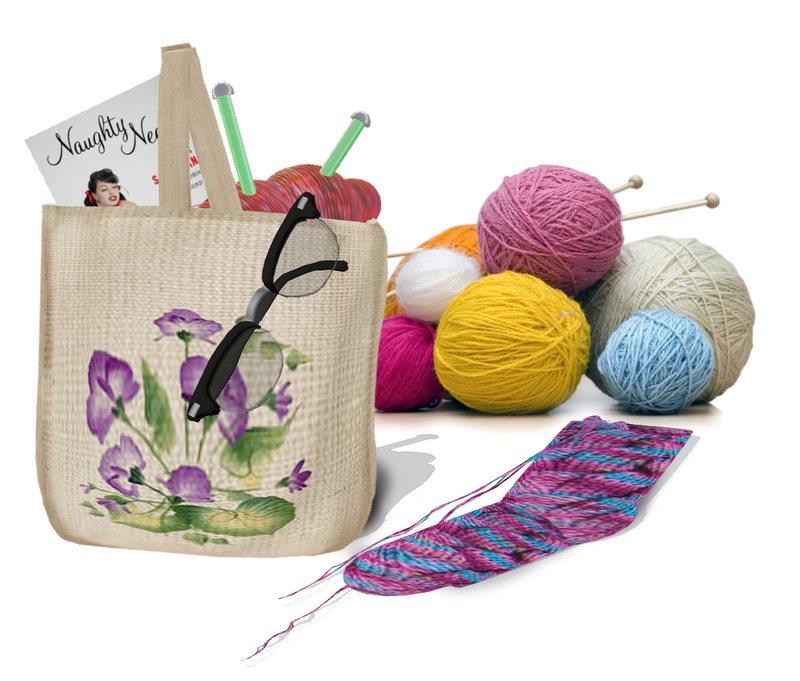 The set comes with cute carrying bag, sock, knitting needles and animation. (The yarn is my own.) Find the set from Rosalind Wriggleworth here. I am wearing a casual, comfy look with lots of (!) knits. The dress is from Anuenue (so sweet) and the bolero knit shrug from Ibizarre. (The texture on these shrugs is beautiful, like all the textures from that store.) The tights were knitted by Kurotsubaki and come in a pack of great colors. I love the big dots. I don’t wear ughs in RL but for some reason I love them in Sl and own way too many.